House Judiciary Chairman Robert W. Goodlatte, R-Va., is scheduled to hold a high-dollar fundraiser in Silicon Valley next week — but frustrated tech donors are already grumbling about the event, disappointed by the lack of progress from House Republicans on one of their top policy priorities: immigration legislation. 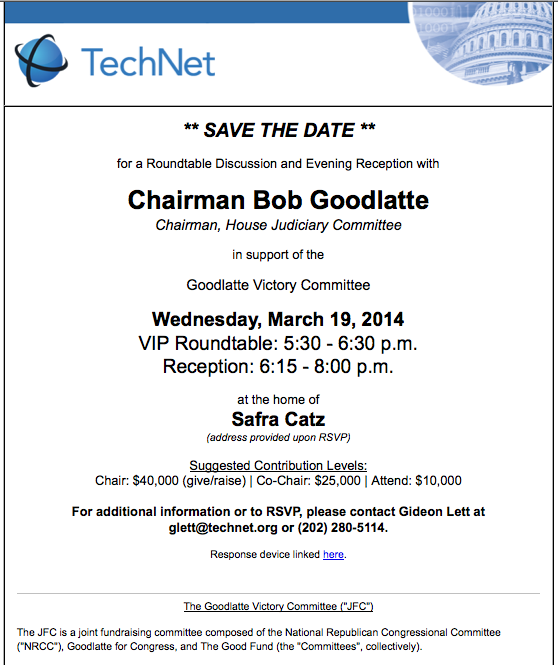 According to an invitation obtained by CQ Roll Call, the Goodlatte fundraiser is organized by TechNet, which bills itself as the "preeminent bipartisan political network of CEOs and Seniors Executives that promotes the growth of technology-led innovation." Suggested contribution levels for Wednesday&apos;s round table and reception with the powerful chairman range between $10,000 and $40,000 for the Goodlatte Victory Committee. Not every big-time tech donor, however, is ready to cut a check, because Goodlatte&apos;s Judiciary Committee has jurisdiction over immigration legislation. "In this case, because there&apos;s been mixed messages from the Republicans, before I write my check, I wanted some assurances that Bob Goodlatte would be prepared to discuss immigration reform and what the timetable is for immigration reform, because we&apos;re coming down the wire here with the [midterm] elections [approaching] and we need accountability," said Ron Conway, a top angel investor and venture capitalist, adding that he had contacted TechNet via email with his concerns. As CQ Roll Call reported last week , Republicans are risking political retribution from their most prominent donors if they do not pursue immigration legislation — and soon. According to Political MoneyLine, Conway and his wife have already donated more than $140,000 this cycle to Republican and Democratic candidates. That&apos;s enough to earn them a spot just within the top 100 individual contributors, according to the Center for Responsive Politics. "I&apos;m waiting to hear back from TechNet, that they can assure us that Bob Goodlatte can give us a tangible schedule ... then it&apos;s worth it for us to cut the big checks," Conway said. "Bob Goodlatte is a huge gatekeeper in this regard, and we need his help." Technology entities have emerged as one of the top, best-financed lobbyists for an immigration overhaul, as they hope to increase the number of visas for high skilled laborers in math and sciences. Facebook creator and CEO Mark Zuckerberg, for example, launched a political group, FWD.US, to advocate for pro-tech policies. The bipartisan Senate immigration bill, which provides an eventual path to citizenship for America&apos;s approximately 11 million undocumented citizens, was viewed as one of the first big wins for such groups when it passed in June 2013. The House, however, has stalled on approving a companion bill. The last major action on the issue came in late January when Republican leaders distributed immigration principles to their rank-and-file members. The backlash to those principles from House conservatives seemed to outweigh support from the GOP establishment. Now it appears that the initiative is in limbo, with the calendar before the 2014 midterm elections shrinking. A spokesperson for Goodlatte declined to comment for this story. A source close to the fundraising event&apos;s organizers defended Goodlatte&apos;s standing in the tech community, saying that many believe him to be a "good and positive partner." "Silicon Valley still views him as a thoughtful and deliberative guy that they like working with," said the source. "The tech community in general sees Goodlatte as a good and positive partner and there&apos;s a lot of support for [him]."